Don't curse your calves or make excuses for them. Burn down your weaknesses and turn them into weapons with this two-pronged training approach from Kris Gethin! Calves were once a stubborn weakness for me, as they are for millions of other people. For a long time, I made excuses for my weak calves—bad genetics, high muscle insertions, or other training priorities. But it bothered me more than I let on, so I silently hoisted more weight on my shoulders in the standing calf press than in any other lift. It didn&apos;t seem to matter, but I wasn&apos;t about to submit to normality or accept failure. I decided I would solve this riddle by dissecting my training and nutritional protocol to find and correct the fault in my lower legs. I bought a notebook and swore that, one day, it would contain my answer. I would chart every new workout principle and exercise application, and I would train like hell, until I finally cracked the calf code. It took time and a lot of self-inflicted torture, but I eventually found my answer. It involved a technique component, but just as importantly, a significant mental shift. This is how I found both. I started with what I had heard worked for other people. I built up to daily calf-training sessions, and experimented with partial reps, 21s, German volume, slow negatives, soleus and gastrocnemius double splits, priority training, and seemingly everything in between. No matter how I elevated time under tension or how much iron I moved, it never seemed to work. It wasn&apos;t until I suffered inflammation in my biceps tendons and around my knees from regular heavy lifting periods that I found the formula that would one day turn my calves into bulls. Due to the nagging pain associated with the inflammation, I was forced to go lighter and adopt a high-volume approach. 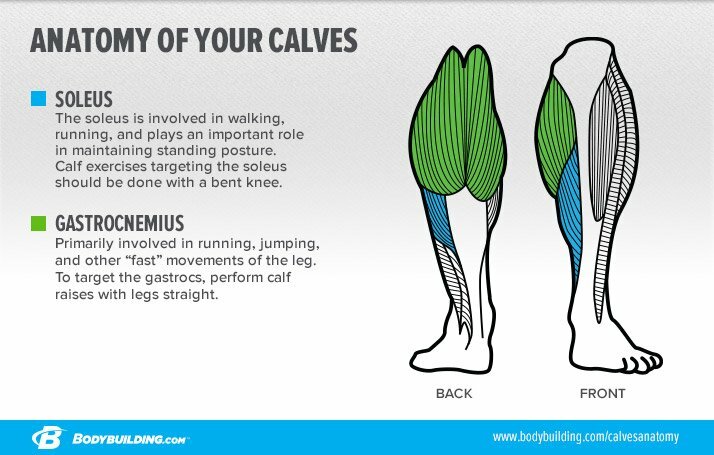 I coupled this with much shorter rest periods, as well as brief bursts of heavy weights and low reps.
Around the same time, I also started doing more to understand the anatomy of the calf muscles. The soleus resides just under the gastrocnemius and is primarily fired when the leg is bent. The seated calf raise, of course, is the optimal exercise for the soleus. Underneath the soleus lies thick webbing called fascia, which is essentially the sheath of connective tissue that prevents muscle from continuously expanding. If blood is unable to flow freely through this area to stretch the muscle fascia, the gastrocnemius will also be deprived of essential oxygen and nutrient-rich blood, which will dampen its potential to fully grow. The more I learned about this fascia, the more I started thinking that the soleus should take priority in my training. So I started performing seated calf raises before moving on to the standing calf press, a technique I still recommend today. This primes the gastrocnemius for growth, stretching the fascia and ultimately allowing better blood flow to both muscles. So calf growth is all a question of exercise programming, right? Not quite. Not if you know how I train. A good workout begins and ends in your head. Before I turned the tipping point of transforming my weakness into a weapon, I began working on my mental preparation. Training the calves beyond the point of failure is much more painful, in my opinion, than any other muscle group. I knew I had to embrace the pain and enjoy it enough to use it to my advantage. But that&apos;s easier said than done—even for me. First off, I decided my leg workouts would begin with calves, when I was strongest and freshest. But that workout principle doesn&apos;t really capture what it signified. My father always told me that the element of surprise was the best offense in any attack. So I pictured my enemy—a full battalion of soldiers defending every inch and angle of the surface of my calves. I had caught them sleeping at the start of the workout, but even with this advantage, I could only dominate them by being utterly ruthless and impervious to pain. Anger, excitement, resentment, anxiety—all manner of positive and negative emotions were crucial to my success. I bottled them all inside me, hoping to maximize the pressure so that I could unleash them all on the battlefield. 100% Pure, Vegetable Fermentation, GRAS Approved, Made in the USA Go Now! As soon as I walked into the gym, I knew it was time to dehumanize myself. I smelled the air one last time, knowing I wouldn&apos;t inhale as a human for the next 30 minutes. Then I closed my eyes and opened again them as Kaged Muscle—my alter ego—part animal, part machine. I locked my teeth and clenched my fists. It was time to release the first wave of adrenaline on the seated calf raise. I pushed hard, but without too much ballistic form. The animal was still in charge for the moment. But once the pain crested and I felt the muscles pull tight on my bones, the machine took control. Immediately, the pain became extinct. There was only the goal: pure failure. When I reached it and had no choice but to stop, I looked back and expected to see a pool of blood. To my chagrin, I had to wait 45 seconds to do it all again—just enough time for my ATP to recharge, but not enough to allow the blood to escape the engorged soleus. I repeated the same process, somewhere around 30-40 reps for 4 sets. I don&apos;t put a number in my head to stop at—I only think of the minimum number I want to surpass. Never count the reps; make them count. Within a minute of concluding the last set, I was already pushing through my first set of standing calf presses. The animal awoke, forcing me to explode through the concentric portion, while the machine battled to control the eccentric. I&apos;ve learned the hard way that going too fast can be the Achilles heel of optimal calf development. Plus, going slow is more difficult, and your goal should always be to make things more difficult. This time, I targeted 20-30 reps. Once I reached failure with the explode/slow reps, the machine and animal united to guide me through another 10 (minimum target) faster reps. That&apos;s how to use ballistic tempo training calves: not as a fake intensifier for every rep, but as a last resort when nothing else will do. The 60 seconds of rest and seclusion I allowed myself were spent stretching the calves and scouring my body for the adrenaline I would need to repeat the torment. Another 4 sets of blood-burning development were my reward. I celebrated the conclusion of the workout with two supersets of the same rep ranges, starting with the seated calf press and moving immediately onto the standing calf press, complete with the 10 (minimum) burning bouncing reps at the end. Nothing more could be done. Rest 60 seconds between sets, stretching calves while resting. This wasn&apos;t the end of my leg workout for the day. On the contrary, it was just the beginning. But after surviving any calf gauntlet like this, I would always smile, knowing that come what may, I had achieved something that day. I was another step closer to turning my weakness into a weapon. Sure enough, in the weeks after starting this workout, I began to see the type of consistent growth, fullness, and separation I had always wanted in leg muscles. If you want to turn your calves into bulls, try it—but be prepared to leave your humanity at the door. You have to become something more than human and let the animal take over. Stack Your Results! The Ultimate Muscle Building Stack! Go Now!